I crossed the country last weekend to participate in the annual meeting of the American Association for the Advancement of Science in Washington, DC. It’s the biggest general science meeting of the year in the U.S., and I was excited to attend along with thousands of other scientists, science writers, science policy experts, and educators. I darted from session to session to see as many interesting sessions and talks that I could, including ones about gravitational waves (of course! ), science in Iran, communicating science with humor, and grand visions of the future of science—presented by the heads of NASA and the National Science Foundation, among others. But I’d like to share some other findings presented at the AAAS meeting, about public opinion on science and technology issues. Cary Funk of the Pew Research Center warned that journalists should not oversimplify the state of affairs. “There are a mix of factors underlying public attitudes toward science-related topics,” she said. Based on Pew and Gallup surveys, it seems that people’s views on climate change vary with political ideology or party affiliation, with age, and to some extent with geographic location. Their views don’t seem to vary as much with gender, race, religion or education level. 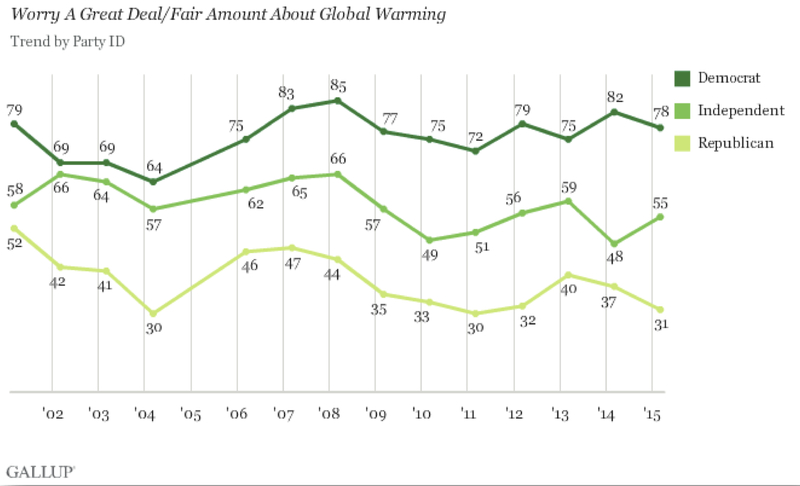 It turns out that views of climate change are different around the world. In particular, Latin Americans and Africans, more than people elsewhere, think that climate change is a very serious problem and that it’s harming people now, and they’re more concerned that climate change will harm them personally. 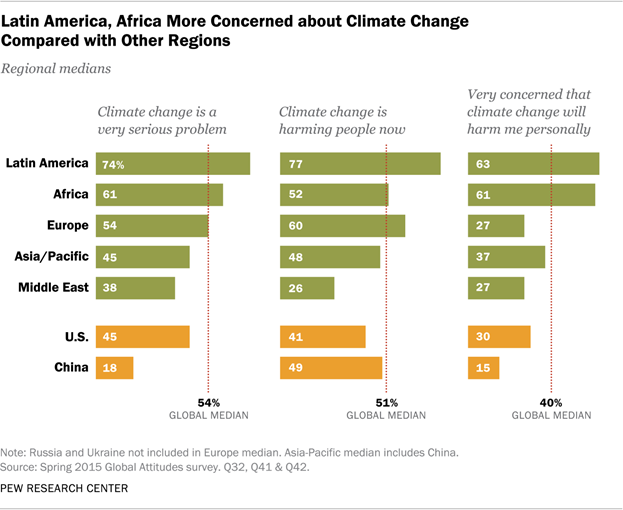 In contrast, people from the U.S. and China—the world’s biggest greenhouse gas emitters—expressed much less concern. “Overall, people in countries with high levels of carbon dioxide emissions per capita tend to express less anxiety about climate change than those in nations with lower per-capita emissions,” the 2015 Pew report said. 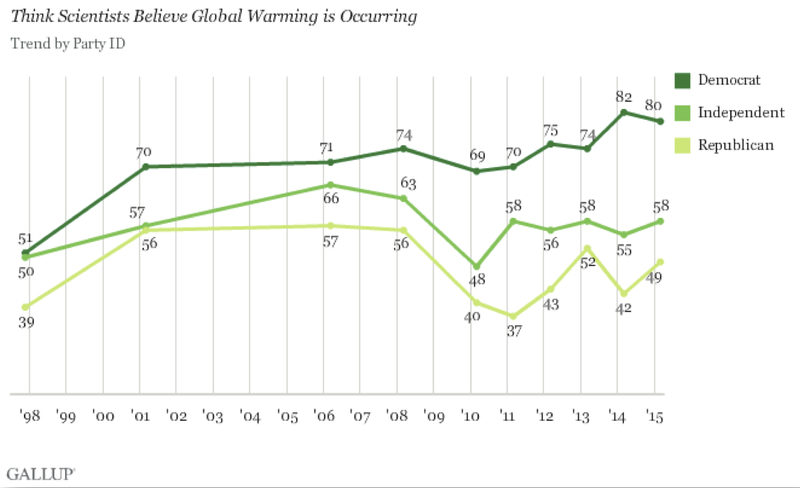 This probably won’t surprise you, but Lydia Saad and her fellow researchers at Gallup see a huge political divide among those who identify as “Republican” and “Democrat” when it comes to: how much people worry about global warming; whether they consider global warming a serious threat; believe the effects of global warming are already occurring; believe that there is a scientific consensus; and believe that global warming is caused by human activity. The 2015 Pew survey finds the people have similar political differences on: fracking, prioritizing wind and solar energy over fossil fuels, offshore drilling, and regulating power plant emissions. And here’s the kicker: during an election year and following the warmest January on record, climate change currently ranks only #14 on the list of voters’ priorities, according to a Gallup poll this month. (The economy, jobs, and national security topped the list.) Nearly half of people surveyed considered climate change extremely or very important in their vote for president though, so we should still ask what the top presidential candidates have to say about these issues. What do the presidential candidates think? Now that the relentless, ceaseless, interminable, monotonous and tedious political campaign nears its end—with nine months to go before it gives birth to a fledgling president—it seems to be a good time to review the candidates’ positions on important issues relevant to science, especially climate change and energy policy. This takes on extra importance now, as the Supreme Court has complicated or delayed efforts to implement the Clean Power Plan. Depending on who replaces Scalia, completing this plan and building on it may be the charge of Obama’s successor. I’ve ordered these candidates alphabetically by party and then by last name. Clinton says that she will expand clean energy, especially solar; create clean energy jobs; improve energy efficiency in homes and other buildings; increase fuel efficiency of cars and trucks; and since last fall she has expressed opposition to the Keystone XL pipeline. (She had not taken a position one way or the other before that.) Clinton also has a $30 billion plan to “revitalize coal communities” and help them transition toward an economy based on cleaner energy sources. She has a modest goal of reducing greenhouse gas emissions by 30% below 2005 levels by 2030. Note that, like Obama, Clinton has changed the goalposts, as they say, from the standard baseline: relative to 1990 emissions, this would amount to a reduction of less than 4%, which is tiny compared to plans proposed by European countries and Russia. Like Clinton, Sanders supports improving energy efficiency in buildings, electricity grids and cars; investing in renewable energies—especially solar and wind; and aims to create many green jobs. In contrast with Clinton, he opposes fracking and offshore drilling. He recently (in December) released a climate action plan, in which he advocates for a carbon tax and for steeper carbon emission cuts by 2030. Stein also has an ambitious climate action plan, and her stance on many energy and climate issues is similar to Sanders’s. Her plan includes a “Green New Deal” to promote the creation millions of green living-wage jobs by investing in clean energy infrastructure, public transit, and more sustainable agriculture. But unique among all the candidates, she aims to achieve 100% clean energy for the U.S. by 2030. Johnson, a leading Libertarian candidate, does not appear to have a climate plan or a detailed energy policy. He accepts that climate change is human-caused. He favors natural gas and to some extent coal power plants, and he emphasizes a free-market approach and opposes cap-and-trade systems. Cruz, like all of the leading Republican candidates but unlike candidates from any other party, does not believe that climate change is happening. He opposes “climate change alarmism.” He is the chairman of the Senate subcommittee on Space, Science, and Competitiveness, and he believes that there is no consensus among scientists about climate change. Cruz supports fracking, the Keystone pipeline, and increasing offshore drilling. Rubio’s positions appear to be similar to Cruz’s. It’s not clear to me whether he believes climate change is occurring, but he has clearly stated that it is not human-caused. Like Cruz, he supports fracking, the Keystone pipeline, and increasing offshore drilling, and he opposes cap-and-trade programs. Trump does not have a climate or energy policy. He believes that climate change is not happening; it’s just the weather.